Mechanics is the science of motion and includes things like the science of falling and gravity, of mechanisms, of pressure and of aerodynamics. Sound is also technically included in this category though we've separated it for clarity. We have a number of mechanics projects which we will share in the next batch of posts, but we wanted to take this opportunity to highlight some of great mechanics projects created by other institutions. This is an Exploratorium Science Snack we particularly like, which records the pendulum motion of a suspended platform to create what is called a harmonogram. We sometimes call this a pendulum drawing machine, because the drawings it makes are a record of the motion of a pendulum swinging in 2 dimensions. The drawing created illustrates conservation of energy, the conversion of gravitational potential energy to kinetic and back again, which attempts to maintain the motion of the board and friction between the pen and paper, as well as the in the ropes which slows the board down. This is another activity derived from a Exploratorium project called Bottle Blast Off. The basic idea is to make and optimize paper stomp rockets for maximum flight distance. When we do this activity we usually start by launching a finless rocket, students can choose to use their paper long or short ways to make different length tubes and then test them. Having a few extra sections of pvc pipe to roll the paper onto will produce rockets that travel farther as they will fit snugly onto the lunch tube. Optimally you want to roll the rocket as tight as you can while it can still slide off the tube easily (contrary to the original instructions). Next, we add fins letting students chose the number and position of the fins and test until the rockets fly well. Finally, you can add some weight to the nose, 2-4 pennies work well, to increase the rocket's momentum and test again. You can also test things like adding nose cones, and the difference launch angles have on flight distance or adding small wings to make a rocket glider which is hard to achieve but cool when it works. The launcher is just a piece of 3/4''x18'' pvc pipe duct taped to a length of vinyl tube (3') and then to a 2 liter bottle. A well built stomp rocket, where the tube is rolled tightly can fly over 200 feet. This can makes avoiding obstacles more challenging than expected. Wind Tubes (which are also an Exploratorium invention) are basically vertical wind tunnel into which you can place various objects and watch how they interact with the stream of air. Think of it like miniaturized indoor sky diving for cut up paper and food containers. When we work with wind tubes we usually give the simple prompt to chose some action spin, tumble, float and then try to make your object do that action. Being this explicit is not really necessary, wind tubes are engrossing and people, kids or adults will typically be more than willing to spend a lot of time with an object until it flies how they want it to. 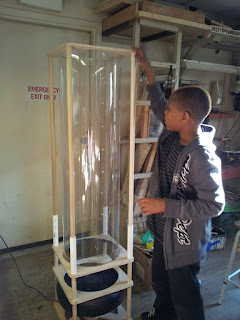 Wind tubes are a powerful teaching tools capable of implicitly giving people pertinent insights on aerodynamics as they modify their objects and correlate form and behavior in the air stream. Following wind tubes with an activity like stomp rockets is a good way to apply some of the phenomena seen during wind tube experimentation.